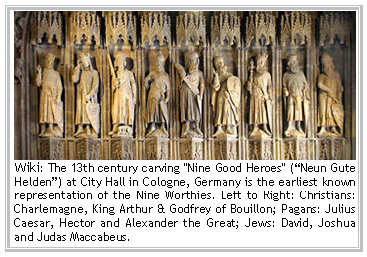 Nine Worthies, nine great heroes of history (generally three biblical, three legendary and three historical). The Nine Worthies include three good pagans: Hector, Alexander the Great and Julius Caesar, three good Jews: Joshua, David and Judas Maccabeus, and three good Christians: King Arthur, Charlemagne and Godfrey of Bouillon. Sources: Hans Burgkmayr (1473-1531), a prominent engraver from Augsburg, who made a suite of Nine Worthies engravings in 1516 (HB). Barthélémy de Chasseneuz: book, 1586, Frankfurt (BC). Jerome de Bara, 1581 (JB). A 15th c. tapestry in Basel (B15). The tapestry suite at the Cloisters Museum, French ca. 1400 (NYC). There is little variation in his arms, which were logically those of the German Holy Roman Empire, understood to be the continuation of the Roman Empire. Tradition was firmly established for those arms, derived from the fact that David was the psalmist and played on the harp for Saul. The arms of Charlemagne go back to the 13th century, in Adenet le Roi’s poem Enfances d’Ogier. Little variations in those arms, except on the tincture (in some traditions, he is given 11 crowns rather than 3). His arms are usually those of Jerusalem, but they are sometimes impaled with either his family arms (Flanders) or the arms of Bouillon. Portrait ofCharlemagne by Albrecht Dürer. Under construction. 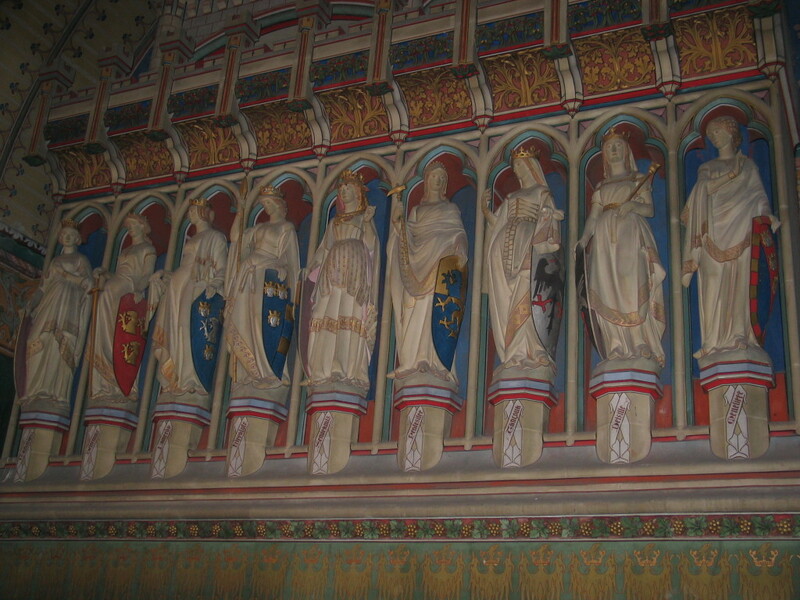 Out of love of symmetry, the Middle Ages also came up with the Nine Worthy Women (les neuf Preuses). Their list was much less standard, however, and not always structured in pagan/Jewish/Christian. Wife of Brutus, her suicide after being raped by Tarquinius prompted the overthrow of the Roman monarchy in 510 BC. The arms are hard to read in Burgkmair’s engraving. Mother of Coriolanus, she persuaded her son to stop fighting with Rome’s enemies. Gules the letters SPQR in bend sinister between two bendlets sinister argent. Her death in 449 BC at the hands of her father to avoid fallin in the hands of a lusting decemvir prompted a popular revolt and the retreat to the Aventine. per bend sinister Azure a dove (?) essorant argent, and Gules. from the Book of Esther, saved the Jewish people in exile from a plot to destroy them. Azure a city gate or. famous heroin who killed the Assyrian general Holophernes after seducing him. Gules on a bend sinister argent a ? sable. heroin mentioned in Judges 4:17-22 as having killed the chief of the Canaanites after he took refuge in her tent. Per chevron argent and gules three Hebrew letters counterchanged (this is uncertain). mother of Constantine the Great, according to legend found the True Cross in Jerusalem. Per pale, gules on the breast of a double-headed eagle sable an escutcheon gules bearing a cross between four B’s or, and Gules three crowns or. Per pale, 1 per bend gules and azure a lion argent, and 2 Azure three crowns or. per pale Azure a lion barry argent and gules, and Barry of eight gules and argent. The novel was composed by a Piedmontese nobleman who left one of his castles, Manta, to an illegitimate son: one of the rooms of the castle contains frescoes depicting the worthies (both male and female) with their arms, as in the illuminations of his father’s manuscript. In the 15th c. Triomphe des Neuf Preux, one finds: Deborah, Judith, Esther, Susanna, Lucretia, Boadicia (Boudicca, who led a Celtic rebellion against the Romans c. 60 AD), Mariamne, Saint Clotilde (who saved Paris from Attila’s invasion), Andegona (Antigone?). Other lists include the names of Semiramis (queen of Babylon), Tamyris (or Tammaris, queen of Egypt), Deiphile (mother of Diomedes), Creuse, Melanippa (an Amazon), Lampeto (queen of the Amazons), Orithya (Amazon), Penthesilea (queen of the Amazons killed by Achilles), Hippolyta (queen of the Amazons, killed by Hercules), Tanaquil (ambitious wife of Tarquinius the Elder). 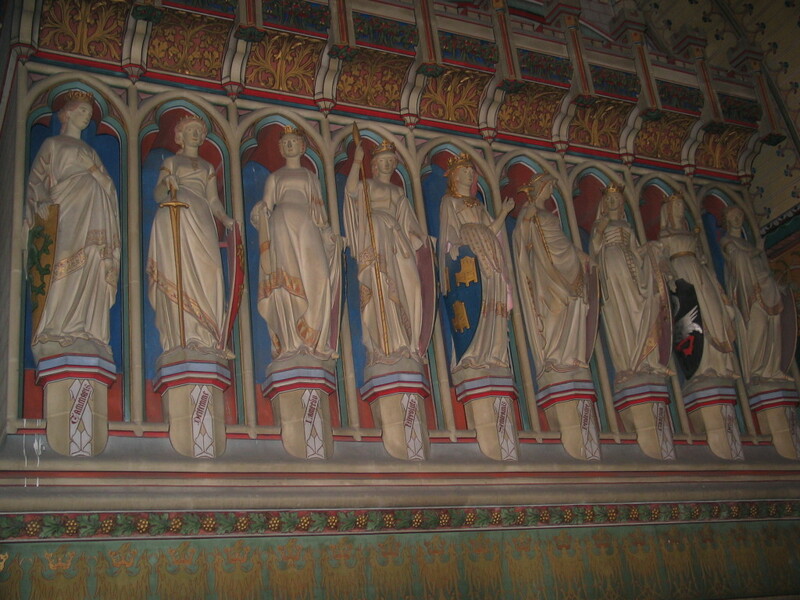 These statues of the female worthies with their coats of arms are in the castle of Pierrefonds, near Paris; they date from the mid-19th century.